Listened in to the landing attempt. That is a great team. It was sad to here the loss com, regain com, and reset system calls. Experience reported 'bad day' when hearing "lost communication". Not sure who wrote the article on the main page, but it is incorrect in noting that the engine failed - it should be corrected. Israel to the moon! Preliminary data supplied by the engineering team of SpaceIL and IAI suggests a technical glitch in one of the components triggered the chain of events that caused the main engine of the spacecraft to stop. Without the main engine running it was impossible to stop Beresheet's velocity. Beresheet overcame the issue by restarting the engine. However, by that time, its velocity was too high to slow and the landing could not be completed as planned. Prelimanry technical information collected by the teams shows that the first technical issue occurred at 14 km above the moon. At 150 meters from the ground, when the connection with the spacecraft was lost completely, the spacecraft was moving vertically at 500 km/h to the inevitable collision with the lunar surface. "the little lander was only included in some of the earlier missions (Rangers 3-5), none of which actually impacted the moon"
Ranger 4 did impact the Moon, on the far side. While NASA regrets the end of the SpaceIL mission without a successful lunar landing of the Beresheet lander, we congratulate SpaceIL, the Israel Aerospace Industries and the state of Israel on the incredible accomplishment of sending the first privately funded mission into lunar orbit. Every attempt to reach new milestones holds opportunities for us to learn, adjust and progress. I have no doubt that Israel and SpaceIL will continue to explore and I look forward to celebrating their future achievements. Here's the list of first impact on the Lunar surface. I got these dates from Wikipedia, so buyer beware! The truth is that they forget that Rangers 3, 4 and 5 were also intended to survive landings on the Moon and all three failed. That's not how I remember it. The Ranger spacecraft didn't have landing gear, landing motors, or anything required to actually make a soft landing. They were crashed deliberately. Those which were crashed deliberately were Rangers 6-9, after the programme was redirected towards sending back photos of the lunar surface during approach. The original lander had a retrorocket and the spherical capsule was designed to survive the Moon landing - like Luna 9 et al. Sequel Beresheet 2.0 has been announced! Quick gleaning of news today - Leonard David reports LRO's LOLA laser will attempt to get a reflection from the ball-shaped reflector, if it survived the crash. No word yet on if any magnetometer results were transmitted. Kahn will begin a Beresheet 2 mission right away. Flight in 2 or 3 years. A consolation: They were the first private, and first Israeli, impactor to reach the moon and actually make an impact. Not the mission plan but it's an achievement nonetheless. I'm just amazed at how much they accomplished for the budget they had. The main contractor was IAI, Israeli Aircraft Industries, that has built orbital rockets, spy satellites, fighter jets and complete missile systems, is a first-tier arms contractor and so honestly - I have no idea what they're even looking for in a place like X-Prize where they're competing against much much less experienced university-based groups. That it still glitched and crashed is honestly embarrassing, and the whole "we're a tiny country" drama is overplayed. Not that it's an easy task by any means, but this was no hobbyist shoestring effort. I disagree about it being embarrassing. A ~$100M Lunar soft lander would be a very aggressive target from any established space agency or aerospace organization. It's hard to imagine any "western" / "1st world" organization doing it on that budget outside of a high risk mission with some corner cutting. The fact that they got so close on the first try is an impressive achievement. Yes, IAI is an established aerospace developer, but it's still a unique system well outsider their usual repertoire. +A direct line to the PM to get any expertise they need. IAI makes missiles that hit other missiles... This was a malfunction, but nothing to do with budget or being a small country. Kudos etc, but if I were some university-based X-prise team, I'd be feeling outplayed. Also - shouldn't x-prize stuff be in commercial space? This was not a science probe, it carried mostly national symbols and artifacts. .. I actually think that's about on par with the Chinese lander/rover, and more expensive than the Indian Mars mission. None of IAI's experience is beyond Earth orbit, only up to GEO altitude. If the mission had been DOA on release from the launcher or failed while still trying to raise apogee out of the region they had experience in and get to lunar orbit, I'd be more inclined to say that was an embarrassment for IAI. Achieving lunar orbit and continuing to maneuver in orbit around the moon isn't embarrassing. A ~$100M Lunar soft lander would be a very aggressive target from any established space agency or aerospace organization. I am not completely sure. That budget after all was for a "naked" lander, with few if any instruments to talk about and no provision for surface thermal control. The sooner they start a crowdfunding campaign, the more money they will collect on the wave of current Beresheet news. Yeah. Chang'e 3/4 are clearly much more sophisticated landers and represent a higher level of effort and are therefore far more expensive. Somebody could do a simple comparison of them in terms of mass and lifetime. I wouldn't argue that the cost scales exactly with the mass, but Chang'e 4 with the rover is almost 9 times the mass of Beresheet. Clearly it cost several times more than Beresheet. Having gone to a number of American workshops on lunar landers and talked to people, I can see a small lander intended to last about 7-10 days on the lunar surface as being in the range of a couple of hundred million dollars, whereas if you want longer life and more capability, it will cost at least 2-3 times that much. So that's how I would equate the Israeli and Chinese landers. 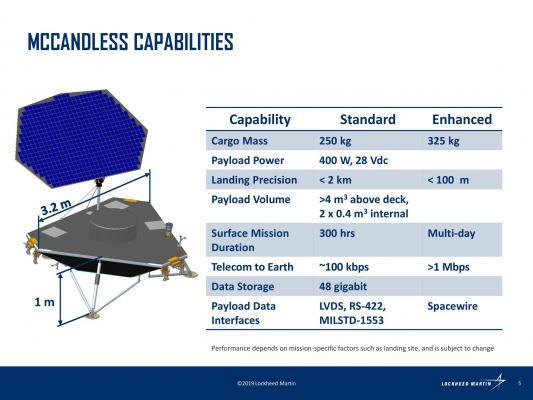 Further update: here's an example of Lockheed Martin's proposed low-end lander. Gives you an idea of the capabilities. The carping about whether IAI is quasi government, whether there is embarassment to be had, etc. is indecourous. Word to the wise is enough I trust. I wonder if LRO will take pics of Beresheet Crater? Yes, but it will be a couple of weeks before LRO flies over the site in daylight.